Hi all! I don't build much in the way of town or city themed MOCs, but i made an exception recently. This is my version of the historic Queen Vic market facade in Melbourne, Australia. The facade itself is actually wider, but i couldn't get my hands on enough tan in time (was building to a deadline), hence the "condensed version" I was inspired to build it by the amazing animal freize above the main doors, i just knew the cow and pig would sit up there perfectly! (well, kinda, the pig keeps falling off) Also, the markets are a bit of a local for me and i wanted to pay homage to it. Anyway, i hope you find something to enjoy in my creation, any feedback or suggestions would be most welcome. ps. i would post a reference pic, but i got all my source material from the web and i don't want to nick other ppls photos. So if yr interested in seeing the building you should google images for "Queen Victoria markets". Thankyou! Sorry, i should have explained the tennis player... idk, i just couldn't do a Melbourne MOC without a sportsperson being in there somewhere? (Melbournites are known for being utterly sports-obsessed) And we had the Australian Open recently, so it sort of fitted. As for the gorilla, he just came for the bananas. Do doubt this is perfect, it has great detail such as the cow, it has got minifigs and even a work truck. Great to see you post this wonderful MOC here as well :] You never confirmed my suspicions though - is that banana thief really an Ausie thing? Even though I live in Adelaide, I have been to these markets and let me tell those outside of Oz it is HUGE....it's where you go to buy cheap leather jackets and men's shoes ! What an AWESOME creation, such detail and in Melbourne an ape at markets....where else but Melbourne.....those Collingwood supporters ! The guy with the truck might be a trader and is unloading his little truck which is also quite nice ! 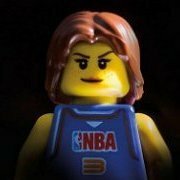 Excellent work 'gabe' and totally Brick On ! 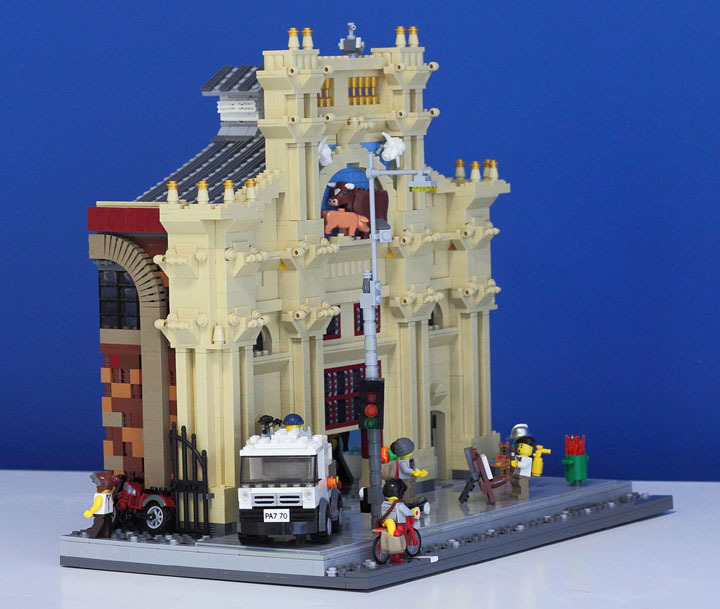 Nice MOC, I have been there myself and you absolutely nailed it. If we had something as good as the Queen Victoria Markets in Perth, I would go there all the time. Thankyou all for such kind words! Very encouraging for a nascent MOC'cer such as myself. No, it's a fish delivery truck. The building behind the facade is a great deal larger (and deeper) than shown, and is where meat and seafood is sold. It is actually only one small part of the markets - there are vast seperate sections for fruit and veg, cheese and deli items and cheap knock-off imports, as lightningtiger mentioned! I can understand yr confusion though, with the truck hiding behind the traffic light. You never confirmed my suspicions though - is that banana thief really an Ausie thing? Quite probably. Cyclone Yasi wiped out over 80% of this seasons banana crop, so prices for bananas have gone, well, bananas. Not quite as bad as with cyclone Larry a few years back, when prices hit $15 a kilo and various Melb underworld characters were reputed to use them as legal tender, but certainly high enough for zoo staff to stop buying them for their primates! ..in Melbourne an ape at markets....where else but Melbourne.....those Collingwood supporters ! Oh you. It's ok, i prefer watching the rugby instead. Ikr?? I grew up in Perth too, it was quite a culture shock when i first moved over here. Ah, you like the Storm do you....actually I like the West Tigers....go figure with my logo eh..any football team called the tigers. Are you going to expand this ? 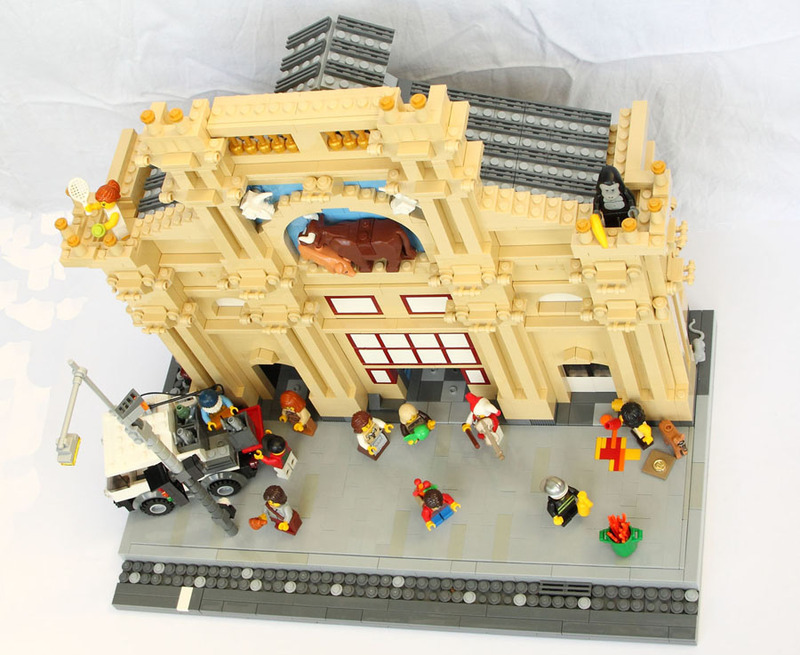 How about a mega MOC.....Flinders St. Station eh ? I'm more a union fan, actually. Used to play and all that. Anyway, i wouldn't touch the Storm with a bargepole atm, what with the massive salary cap cheating which went on there. So if it's ANY footy team called the Tigers, don't tell me you follow Richmond as well? My commiserations if so! Not going to expand, no - i need the bricks for other projects. I'd love to tackle Flinder's St station sometime though, it's a pretty awesome building. Did you know they had a ballroom upstairs there? For the use of employees, apparently, although it hasn't been used for years now. for those who would like to see the real thing, as you can see Gabe has done a briliant job on this Aussie icon . Did you just say you don't normally do city/town-themed builds? Well it looks like you've been doing these for years now as this is simply a wonderful creation gabe! Based on the reference image, I must say you really captured the real thing very accurately, from the overall tan color scheme to the the animal wall details. How did you guess and don't rub it in.....! You going to expand this MOC if you can or leave as it is ? Keep on kicking drop goals ! Thankyou very much for the kind comment and thanks as well for posting a reference pic, since i am clearly too lazy to get my own! Lovely pic too btw. Aw shucks! Thanks heaps, it's very encouraging to hear. Haha, that's ok, at least you can console yrself that you have the best theme song in the league. Yellow and black! Awesome MOC gabe, all that lovely tan, and I love all the detail and lines. It's also a great way to show off you collectable minifigs . Thankyou very much! 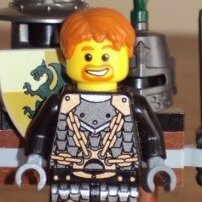 Yeah, a lot of my town compatible minifigs seem to come from the collectables. Some of the HP torso and legs have been useful as well. Just a quick question, is the violin that the jester's playing a Brick arms piece? Brickforge. You can get them with black neck and chin rests now too. I'm really sad I couldn't make the MUGs* meeting now, since you will be destroying this. I was at the Sandown train show all weekend. 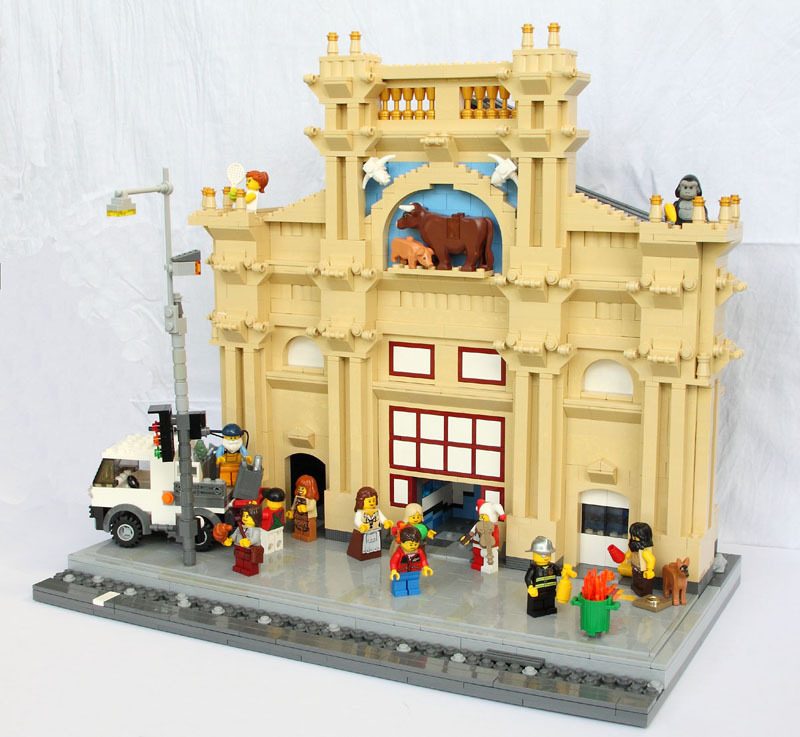 Of all the Melbourne MOCs this was the one I most wanted to see, I think the cow and the pig are perfect and the rest of the facade fit very well. 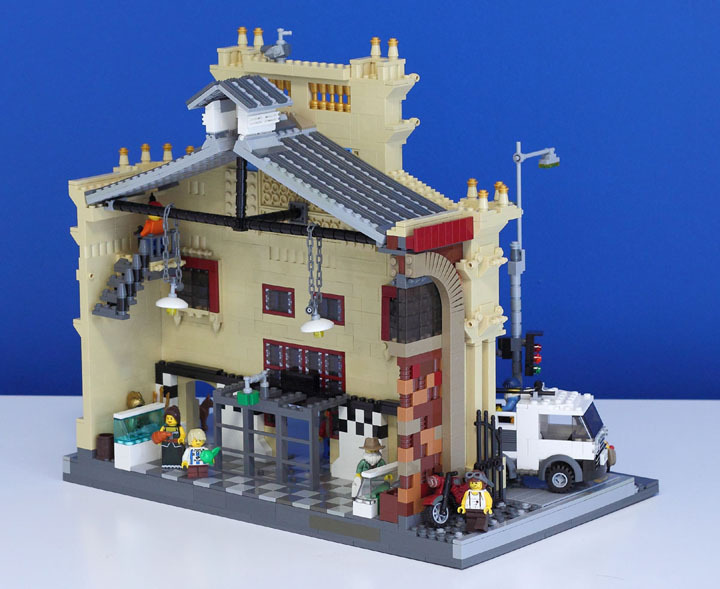 *This MOC was built for a photo shoot of Melbourne icons for a Melbourne newspaper at the monthly meeting of Melbourne Lego Users Group (MUGs). Aw, i'm sorry to have to disappoint you, hopefully i can bring another MOC to the meeting after next? (not sure if i will be able to make next month yet) It was a really fun meeting though, it was my first time there so i was a bit nervous, but everyone was really welcoming. I hope the train show went well! Thanks Leg Godt Gud, i'm glad you like it! Thanks heaps for the feedback. Here you can see the first and second verions side by side. I changed the windows from white to trans-black bricks (and some trans-clear 1 x 2 plates to make the SNOT sections fit - i was a little worried about how that would look, but i don't think it's too horrendous), changed the under-profile of the diagonal ledge, created an interior, changed the left wall from tan to red-brick, added a gate to the left wall and made a few changes to the minifig personnel. This image shows the red-brick wall. I am pretty pleased with the way this turned out. The interior. It's a bit cramped in the fish shops due to the reduced width of the building. But it's all moot anyway, as the model will be against the wall in the exhibition, and thus the interior won't be visible. Oh well! Anyway, i'd love to hear about what ppl think of the changes i've made. Do you think it's an improvement or not? There are more and (slightly) larger pics on my flickr, for those who might be interested. Both of those are fantastic, and I love the details that you've added in the second version. It might please you to know that I've only been to Melbourne twice, and I recognised it straight away. If anyone was up for the challenge of building Flinders Street Station, I'd definitely watch that topic in awe. It's my favourite building in the world. Excellent stuff!! Love all the little architectural details and the interior looks great too. Nice work! !